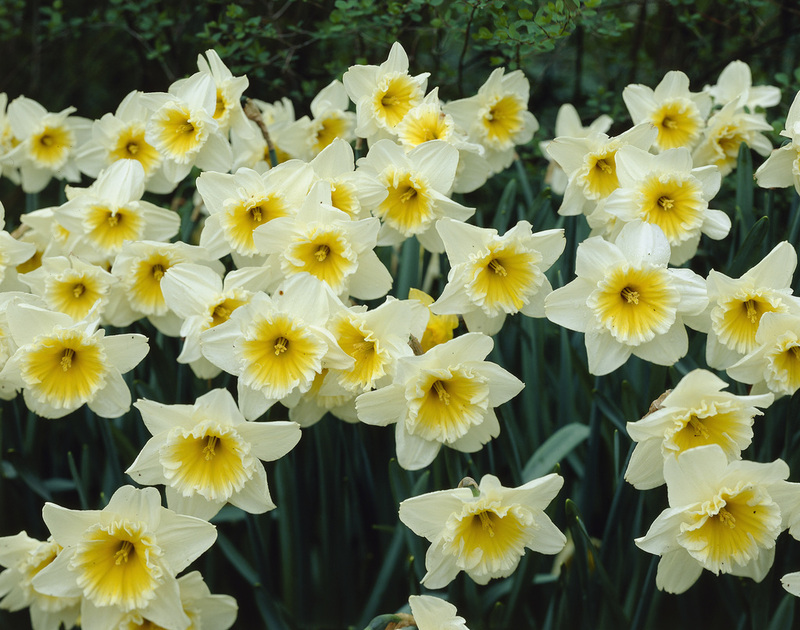 Whether planted in beds and borders, around shrubs or beneath deciduous trees, Ice Follies Daffodils will bloom consistently from year to year. Large, shimmering white outer petals surround a funnel-shaped, frilly yellow inner cup that fades to creamy white as the flowers mature. 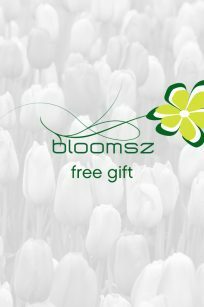 Each stem bears a single 4″ flower emerging amid long, rich green strap-shaped foliage. Be ready for compliments when they’re used as focal points in cut flower arrangements. Amazingly easy to grow. Carefree and naturalizing. Excellent cut flower. Deer, rabbit, and drought resistant. Growing Instructions: Select a spot in the garden that receives full sun to part shade where the soil drains well. Loosen the soil, and plant the bulbs, pointy end up, approximately 6″ deep and 4-6″ apart. Tamp down the soil and water well after planting. 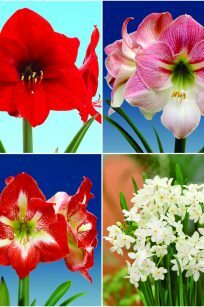 Foliage should be left to die back naturally as it provides the nutrients the bulb will need to grow and flower the following year. Bulbs may also be planted in containers and tubs at the same depth. Mention the word “tulip” and the first thing that comes to mind is a bright red flower with a perfect pyramid shape when the petals are closed. 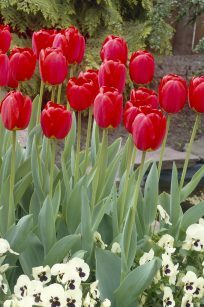 Our Red Oxford Darwin tulips will grow picture perfectly in the garden. Take a closer look at the closed flower, and you'll find waxy petals with a touch of black where they're attached to the stem. A touch of yellow at the base of each petal becomes the true vivid red tulip lovers the world over adore. 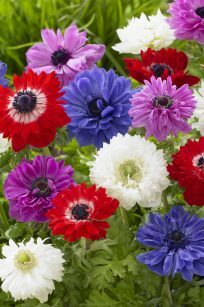 These long-lasting flowers resist fading, and with their strong, sturdy stems are perfect in beds, borders, and containers. Add some to cut flower arrangements for a truly classic look. Easy to grow. Carefree and naturalizing. Excellent cut flower. Everyone knows the joy that daffodils bring to the garden when the bloom in the spring. 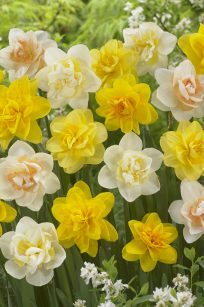 Our Double Daffodil Mix is sure to double that pleasure when fully double flowers approximately 4″ across burst into bloom. The center of each flower has a full, double set of frilly inner petals of yellow, white, or orange growing amid long, narrow gray-green foliage. Grow them in beds, borders, and containers, and even on the lawn. Add them to cut flower arrangements, or group several together loosely tied with raffia or ribbon for a colorful bouquet or display.